The Dying Kingdom See more thrills and chills and heavy drama in the vile Great Kingdom with the wonderful Dani Neary. Secrets of Castle Greyhawk The amazingly talented Sean (PowerscoreRPG) continues his story, exploring the dungeons and lore surrounding this fabled ruin. Return to Greyhawk and Mordenkainen's Path of the Planes. Head honcho, DMShane marches on with his main story lines and playing groups. Where will the heroes venture next? Possibly into the mists of a new plane? Fortune and Glory continues, also ran by DMShane. I have no idea what fortunes and glory has been found so far, but this show has been a boon to the most loyal Greyhawk followers who get to play with this channel. Queen of Spiders The fine folks of this show, creep on through the Underdark lead by the bad boy of DMing of Grant Ellis. Birthright of the Pomarj This story rages on from the orcish POV. Half-orc warlord Turrosh Mak is a name no one will forget. Little Red Dot has the wit and enthusiasm to tell this tale of honor and war! Orchard Unsure of this one, I believe its a story involving feywild. I need to check in on it because it is DMed by the smooth stylings of ProRestarter. Savage Tide Adaptation of the popular high seas, demon-fighting AP from Dungeon Magazine. DM Eric Vulgaris is more than up to the task. Uprising in the Perrenlands A rollicking adventure set in an under-appreciated part of the Flanaess, the mercenary land of Perrenland. Scratticus is a genius for setting up and DMing this one. Rise of the Temple of Elemental Evil Ran by saevrick.is sure to be an amazing re-visitation of the classic adventure set in the World of Greyhawk. I'm excited for this one. Legends & Lore Saving the best for last is a show co-hosted by map making pro Anna Meyer and me! 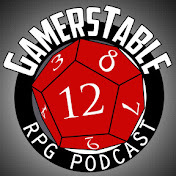 Come see us as we talk Greyhawk lore, maps, Greyhawk Channel stuff and more. It's a casual interactive stream to support all the fine folks above. Tune in next week! Hola Greyhawkers! Things are humming along nicely this Harvester season. Hopefully by Brewfest I'll have more exciting Greyhawk news to bring you regarding the Greyhawk Channel, it's new shows and where it's going in the future. For now I have an amazing gift to show off. 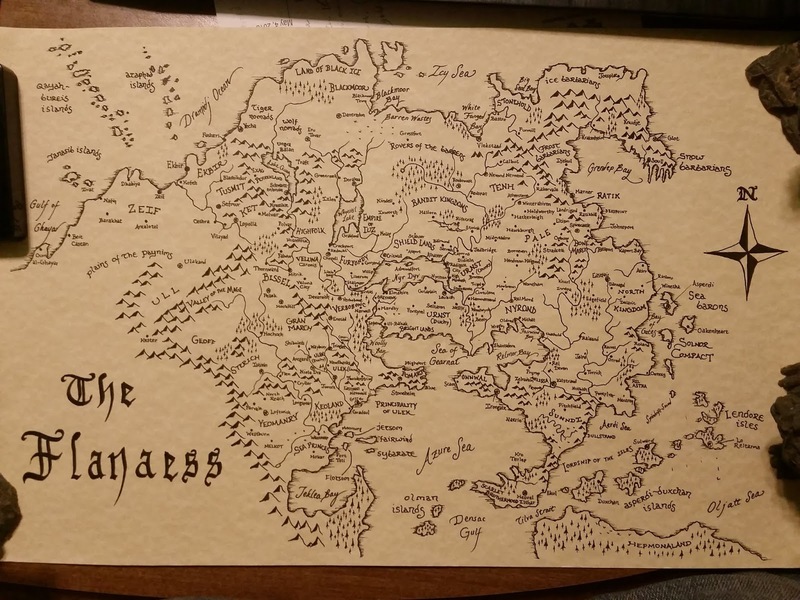 A good friend of mine, Nicholas found this hand-drawn map of the Flanaess at a ren-faire in upstate Illinois and knew I had to have it. Now, I've never seen this particular map design floating out there before, so I don't know if it's original or copied/stolen artwork, hard to tell with these kind of events. It does seem to be a print, so I certainly cant be the only one with this map. Needless to say I'm thrilled to own it just out of rarity. The detail in this map's terrain and labels is exhaustive. Whoever the artist might be (it is not signed), this person is not some hack, but a knowledgeable gamer, in my opinion. Give me a comment if you own this same map or know who drew it, I'd like to compliment them. Otherwise, thank you again Nicholas and until next time, happy gaming all! Hey Greyhawkers! Today I'm pointing you toward a rare opportunity to create something for the Greyhawk and D&D at large. Over at Wizards they are taking submissions for rumors to be included in a special Dragon+ adventure based on the classic module Expedition to the Barrier Peaks. Go check it out, you have until Sept 26th to add your custom rumor, I've already made mine! "In prior community polls, we’ve asked for your thoughts on elemental trinkets, things carried in a giant’s bag, and unusual lich phylacteries. This time, we’re asking for rumors regarding the famed Barrier Peaks. Who can say what’s true or false, but what strange rumors circulate around local taverns about these mysterious mountains (in 150 words or less)?" Good luck, and until next time! Hello Greyfriends. I would be remiss if I didn't promote the amazing Greyhawk work going on over at Greyhawk Grognard. In the last week there has been a lot going on, starting with a two part study on the classic Lost Caverns of Tsojcanth, then Mr. Bloch writes a treatise on design principles for the World of Greyhawk setting. Last and most importantly to me, he does an original take on creating a wholly Baklunish pantheon of deities for the much neglected nations of the west. Joining the likes of Istus, Geshtai and Xan Yae now are gods and goddesses such as Al'hutha god of the sun and truth, Banlasa, god of healing and redemption and Nasri goddess of assassination and banditry. There is many more, and the full article download ("Dragonne" magazine) is marvelously put together with additional deity stats and profiles, plus a new "cleric" character class, the Rashaw. You must check this article out. Greyhawk Grognard has touched on an unfinished area of Greyhawk lore that Gygax himself had intended to flesh out. In terms of quality and research, I'd push forward this new Baklunish pantheon as approved for any Greyhawk campaign. I know the base people of Ull, whom normally eschew good deities, will be taking notice of Nasri, Ya'huth and Duhl Parath. Kudos! Hello Greyfolk. 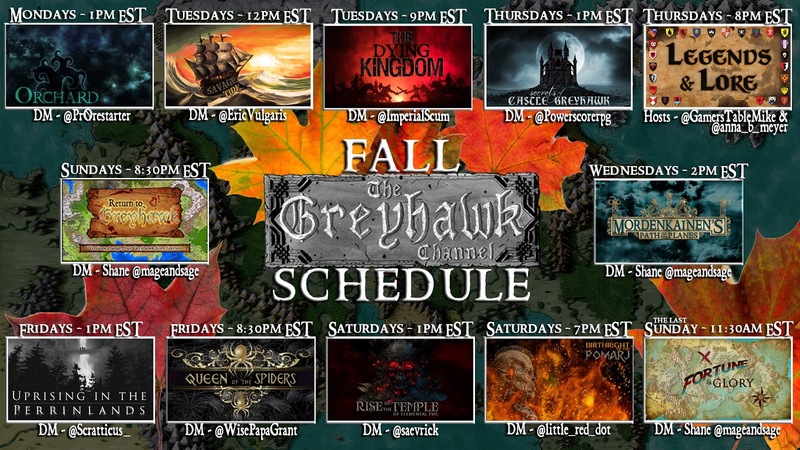 Short post today but I'm here to do a shout for The Greyhawk Channel on Twitch. DMShane hasn't put out his full Fall line-up yet, but some possible show teaser titles so far include Birthright of the Pomarj (sounds awesome), Savage Tide (the popular Paizo adventure path) and Legends & Lore (hmmm). Given last season's huge line-up, I imagine there will be many more and possibly some current shows continuing on to the end of the year. Stay tuned! Howdy Greyhawkers! Today I have a treat. We are going to look back on some old comics from Dragon magazine, no not Wormy or Snarfquest or What's New with Phil and Dixie, I'm talking about the less flashy black and white comics that came before those in Dragonmirth. Readers with any level of artistic or writing talent could submit comics to this column. As a 5th grader back in the 80's reading my first Dragon (#85 - the cover called out to me), I loved two things most about the magazine, the cover art and the comic art in the back. I always came back to the material in-between later. Needless to say I never got the guts to submit a comic up until Paizo Publishing had control of Dragon and Dungeon mags and I was offered a chance to submit a comic strip idea based on my long running Greyhawk comic strips. Sadly Paizo soon lost the license to the print mags and Wizards took them digital. Sans comics. A dark day indeed. Well, we still have these gems below. Some are better than others mind you, but remember, these people had the guts and desire to be published comic strip artists where I failed. Enjoy and look for more classic Dragonmirth!